This years marks the 30th Anniversary of the end of the Great Miners Strike of 1984-45 in Britain. The issue of the Stalinist regimes in Eastern Europe and became a key question in the strike. The regime of General Jaruzelski had driven the ten million strong independent trade union Solidarity underground in 1981. The Stalinist regime in Poland which claimed to be “socialist” assisted Thatcher by exporting coal to help break the British National Union of Miners – the question of the reactionary nature of the Stalinism and need for solidarity with the independent workers movement became a key question of the struggle. To mark the Anniversary of the strike published here is a number of statements and articles from the Polish Solidarity Campaign and Labour Focus on Eastern Europe from the period. SOLIDARNOSC BACKS THE MIN­ERS – JARUZELSKI AIDS THE TORIES. This is Solidarnosc’s message for striking British miners, as expressed in a letter “to the striking miners of Great Britain” from the Upper Silesian committee of Solidarnosc. Despite the total repression which it suffers, the membership of Solidarn­osc rallies to the cause of the miners’ strike in this country. Compare that with the strike-breaking role of the Jaruzelski regime. 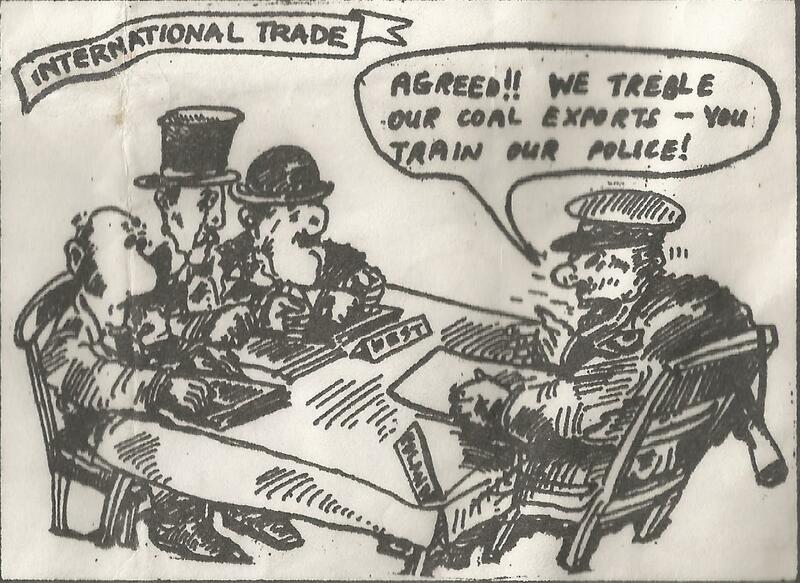 By May of this year, with the miners’ strike well underway, Polish coal exports to this country were running at double their normal rate; at the time of writing, they are now running at more than treble their usual rate. The collaboration between Jaruzelski and the Tories shows up the hypocrisy of the Tories’ lying claims to support free trade unionism in Poland. And it also makes a mockery of those in our labour movement who have sought to justify the repression of Solidarnose in the name of ‘defence of socialism’: when Solidarnosc backs the miners and Jaruzelski aids the Tories, then the need for socialists internationally to de­fend Solidarnosc’s right to exist is further re-inforced. The enemies of free trade unionism in Poland have sought to sow confusion through the personal statements made by Lech Walesa on the miners’ strike. These were his own views, not those of Solidarnosc. No-one would judge the TUC on the basis of what Frank Chappie says. So why judge Solidarnosc on the basis of what Walesa says? (Not that equating Walesa with Chapple is accurate in any case.) A ten-million strong workers’ movement is inevitably going to contain a wide range of views. Solidarnosc’s support for the miners is further evidence of its nature as a genuine trade union, whilst the Polish scab coal exports underline the anti-working class nature of the Jaruzelski regime. 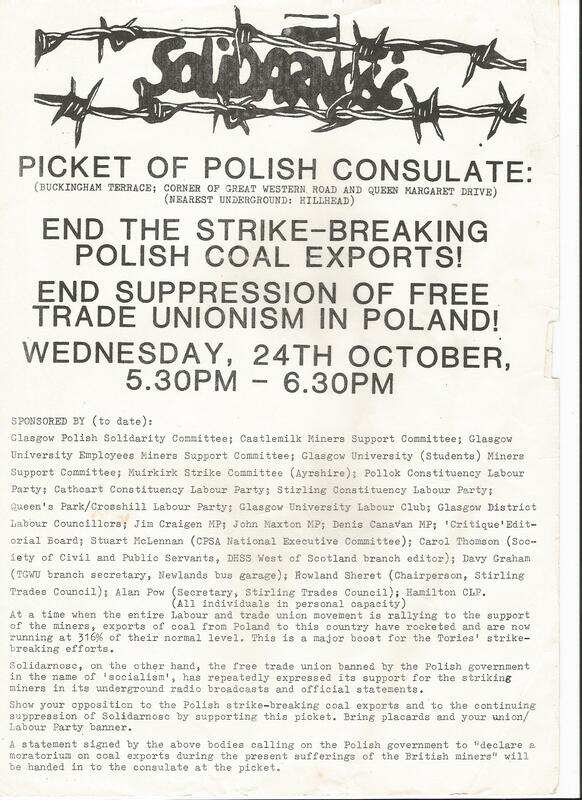 Support Solidarnosc’s right to exist by (re-)joining the Glasgow Polish Solidarity Committee (annual fee; £2.00, waged; £1.00, unwaged; write to the secretary, address above) and/or by inviting in a speaker from our campaign to your next Labour Party/trade union branch meeting. 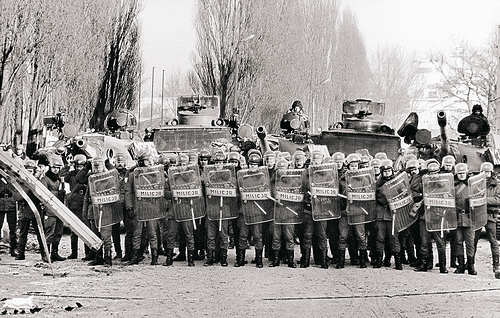 Solidarnosc, as the Polish workers’ movement, must be defended from the attacks of both the Jaruzelski regime and its opponents within our own movement. And, right’ now, supporting Solidarnosc is also to support the British miners’ strike. 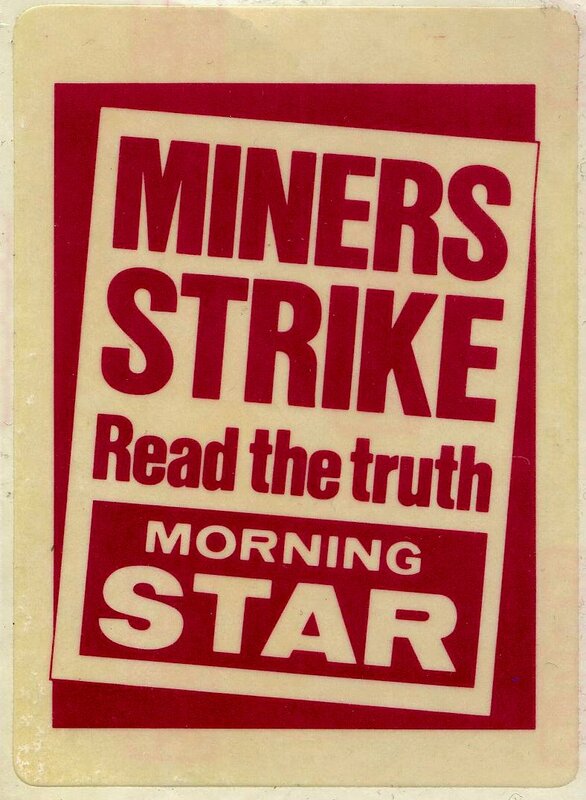 All over Europe trade unionists are responding to the British miners’ strike, since it is widely understood that any defeat of the miners in Britain will weaken all other trade unions in the country and be a setback for labour everywhere. But one of the most important countries in the continent provides the only significant exception to this rule In Poland the suppression of the independent trade union Solidarnosc, means that its voice has been muted, and may now only be monitored on illegal broadcasts, such as that which was recorded from Silesia, supporting the British miners. Meantime, Polish Government commitment to the continued supply of coal to strike-bound Britain continues uninterrupted. Some Polish coal is shipped through the port of Rotterdam, whilst it appears that other coal comes direct from the Polish Baltic ports. 6000 tonnes were delivered at Flixborough, near Scunthorpe, on the 28th May. But often it comes in smaller consignments which are discharged in the lesser ports of Trent and Humber, all of which are unregistered. Scunthorpe steelworkers are quite sure that they can identify all this as Polish coal. The Financial Times (on the 22nd June 1984) has reported the arrival of supplies on “German, French and English registered vessels”. 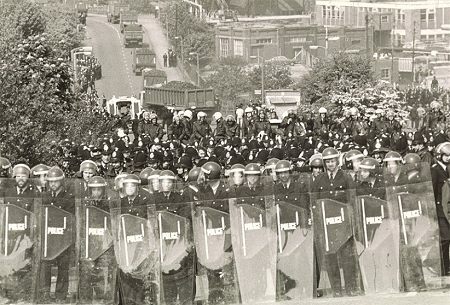 These were directed to the British Steel Corporation’s Scunthorpe works, and an “elaborate police operation kept most pickets away wharves on the nearby River Trent”. In addition to these consignments, the Financial Times reported on 6th June that two large bulk-carriers were on the River Trent, unloading 6,000 further tonnes. At the end of June, four Doncaster pickets visited the Polish Embassy in order to request a cessation of these exports. The Polish Authorities would not budge, however, saying that they were enforcing contracts which had been negotiated as long ago as 1981. But if the independent trade union movement, which might have been expected to black [boycott] exports, is no longer permitted to operate, a double burden falls on the Polish Government which claims to have installed itself (in a military putsch) the better to defend “socialism”. Surely the least thing that can be expected of this military Government, if it were to be recognised as anything different from other military regimes in different parts of the world would be that it would declare a moratorium on coal exports during the present sufferings of the British miners? We the undersigned British trade unionists and socialists call on General Jaruzelski to take appropriate action forthwith. For British socialists, the spectacle of Prime Minister Thatcher “doing business” with General Jaruzelski one day, and posing for photographs with Lech Walesa outside the Gdansk shipyards the next, during her visit to Poland late last year was an unpleasant sight. Eric Heffer, a Member of Parliament for the Labour Party, made this statement. As someone who has supported Solidarity in Poland since its formation and who has been on delegations to the Polish Embassy in its support, I feel I must speak out in relation to Mrs. Thatcher’s visit to Poland and in particu­lar with regard to her declared support for Solidarity. One thing is crystal clear: Mrs. Thatcher has double standards concerning trade unions and freedom. 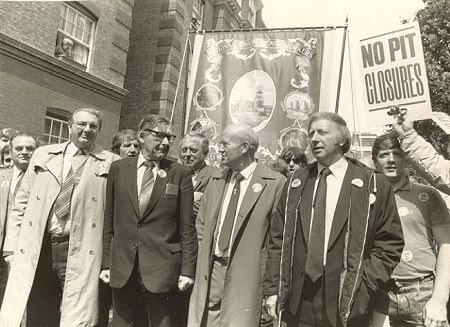 On Far Left: Eric Heffer MP, with NUM leaders and Tony Benn. Heffer was leader of the Labour left and also a champion of opposition to Stalinism. It is also clear that Lech Walesa and other Solidarity leaders are not fully aware (no doubt because of the fact that they do not have a really free press) of Mrs. Thatcher’s hostile attitude to free and independent trade unions in Britain. Perhaps they are influenced to praise her because she is a Western political leader who has declared support for Solidarity and has visited Poland to say so. Obviously, because of the lack of real political freedom in Poland, a system without proper democratic elections etc., some of the Solidarity leaders believe that we must have real freedom for workers in Britain. Unfortunately, they are wrong, that is no longer the case. Solidarity leaders have either wrong information, or they have not fully understood the nature of the Thatcherite government and regime. It surely cannot be an accident that General Jaruzelski praises the economic policies and methods used by Mrs. Thatcher. That he praises her toughness, a toughness used against the trade unions in this country. The truth is, the arguments advanced by the General against Solidarity, strikers and workers’ conditions, are similar to those used by the Thatcher government against British trade unionists. Mrs. Thatcher, in going to Poland and declaring support for Solidarity, is being thoroughly hypocritical. In Britain, her government has presided over wholesale closures of factories and shipyards. The postponement of the closure of the Sunder-land shipyard is surely due to her Polish visit so as not to embarrass her. In Britain, the trade unions have been hamstrung because of the worst anti-trade union legislation in Western Europe. GCHQ workers have been sacked for being in a trade union and workers have been banned from membership of their unions. This is no doubt part of her policy against the “enemy within”. The Thatcherite legislation developed over the years against trade unions and trade unionists destroys rights which have been built up by workers over many decades. Mrs. Thatcher is no friend of trade unionists and one can only assume that in going to Poland to say what she did she was doing that, not to assist the workers in Solidarity, but because of her hostility to a system that she misguidedly calls, and perhaps believes is, socialist. Solidarity’s programme, agreed at its Conferences, does not accept the private enterprise system, but calls for workers’ democracy in industry. That is the last thing Mrs. Thatcher wants. It would appear as if she now feels she can interfere in the affairs of other states and more or less direct them in what to do. It is a dangerous game, especially at a time when the hard-won rights and freedoms of the British people are being undermined by this government. It is surely no accident that a recent edition of the journal Index on Censorship warns about our loss of freedom and human rights, when normally it concentrates on the lack of human rights in Eastern Europe and in dictatorships throughout the world. Here in Britain, elected Labour Councillors have been disqualified for carrying out their promises to their electors, whilst government ministers are responsible for wholesale waste and financial incompe­tence and they remain in office with the full backing of Mrs. Thatcher. This week, the Campaign Group of Labour Members of Parliament sent a telegram to Lech Walesa, explaining what the Thatcher government is doing to British workers and their unions. Clearly, we have to follow that up by other representations and contact. What is required is the unity and understanding of workers in Britain and Poland, so that they can assist each other in fighting then” governments which are both basically anti-union. The Polish workers, because of their opposition to the regime in Poland, as a result of their living in an unfree bureaucratic country, may be swayed to praise for Mrs. Thatcher, but they need to realise that to get rid of Jaruzelski and the bureaucratic system he represents, and to replace it with a type of Thatcherism, would in no way solve their problems. What we need to do together is to fight for real democracy, a genuine socialist democracy and then to assist each other in building a new society East and West, as envisaged by such great socialists as Rosa Luxemburg. Eric Heffer is one of the leaders of the left wing of the Labour Party, a former govern­ment minister and candidate for the party leadership. He has a long record of public support for the democratic opposition in the Soviet Union and Eastern Europe and is a sponsor of this journal.